I Didn’t Choose the Spoon Life… – Do I Look Sick? 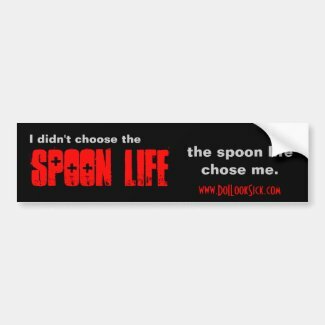 New bumper stickers to show how gangsta you spoonies are. Next How to be the best Student Disability Accommodation Office Ever! I love this too! Not a bumper sticker kind of person but I love the quote. Thanks! I’ll hopefully be posting more stuff with this slogan soon!